Wajax operates more than 100 branches across Canada and represents a wide range of leading world-wide manufacturers. 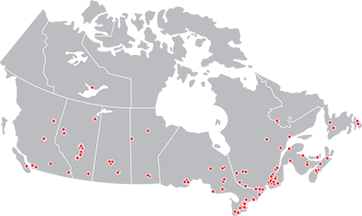 Our customer base covers core sectors of the Canadian economy, including construction, industrial and commercial, transportation, the oil sands, forestry, oil and gas, metal processing, mining and marine. Top line revenue growth is a critical success factor for Wajax which will be achieved primarily by focusing on targeted organic growth opportunities and complemented by selective acquisitions that meet our specific investment criteria. Organic growth will be focused on categories where we have strong manufacturer relationships, significant market share opportunities and an ability to further improve earnings durability. The aim of our strategic plan is to enhance our EBITDA margins by leveraging an efficient platform for growth. Recent restructuring efforts have reduced our fixed costs and we still see opportunities to drive further productivity as we move forward. Combined with higher asset utilization, Wajax can achieve profitability above historic levels. Since 2012, Wajax has reduced its branch count by 20% while enhancing consistency and the overall customer experience. This is a trend that will continue as we consolidate branches in various markets to better serve our clients. We are also investing in significant technology upgrades to improve operational integration, introduce new sales channels and further improve the efficiency of our support teams. Wajax maintains a robust balance sheet and has taken actions to reduce our cost of capital while enhancing our financial flexibility. The key pillars to our financial strategy include maximizing liquidity, driving working capital efficiency and following best-in-class risk management processes. These activities are critical to managing our leverage targets and achieving our shareholder return objectives. Successful execution of our strategic plan is expected to create meaningful shareholder value and lead to superior earnings durability as a result of greater operational diversity, flexibility and efficiency. To achieve our goals, we will maintain a disciplined approach to capital deployment and continue to align the interests of leadership and shareholders. We believe these attributes come together to form a compelling investment opportunity today.